Okay, okay… I admit it. Despite being from the south, I am not a Southern Belle. Hangs head in shame. So, what better way to learn how to be one than from my favorite self-proclaimed Southern Belle and Atlanta Housewife, Ms. Phaedra Parks! 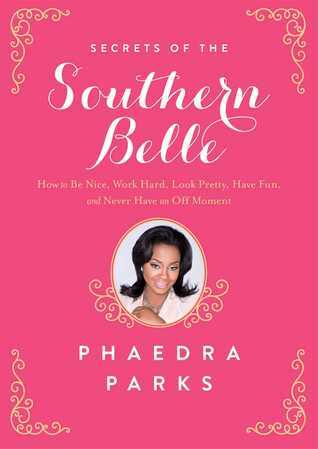 Yes, honey, you heard right, Phaedra has a new book to be released next month: Secrets of the Southern Belle: How to be Nice, Work Hard, Look Pretty, Have Fun, and Never Have an Off Moment. The quick rundown: Phaedra is schoolin’ us on how to be ladies (and gents). She feels bad for northerners and us folks who just aren’t there yet. She breaks it down into sections on how we are to get our lives together. She features how we are supposed to look and behave in all types of settings, including with those we aren’t too fond of. She even offers scripts of what we are to say when certain situations arise. In addition, Phaedra discusses how gentlemen and little ones are to look and behave in social settings. At the end of the book, there is a quiz to see where we are in our Southern Belle-ness and recipes to help us out in the kitchen. My thoughts: I enjoyed it! Seriously, I didn’t know what to expect from Phaedra and this book. I went into this with curiosity and an open-mind and I wasn’t disappointed. She offered some good advice to those of us who need a little help on how to be Southern Belles. I do think some of her advice is relevant for all people, however. I also liked how she added a situation or two involving some other Atlanta Housewives, albeit without adding their names, to illustrate her points. All in all, I enjoyed this book and think The Real Housewives of Atlanta fans will, too.